For those of us, myself included, who are always tweaking WordPress themes from within the WordPress dashboard, there have been a few changes/additions to the WordPress dashboard theme editor. 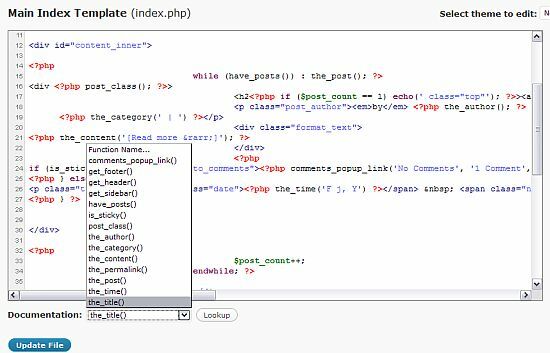 For those who are not familiar with the theme editor, it shows the theme’s files which can be directly edited from within the WordPress dashboard. Keep in mind that the proper file permissions may need to be set on the themes folders and files on your sites hosting account for editing within the WP dashboard. The syntax highlighter is one of the new additions to the theme editor. Enabled by default the syntax highlighting will add line numbers and color highlights to the theme’s code. For some that are not real familiar or comfortable tweaking code, this might be a welcome addition. For the advanced coders, this can be an annoyance that can be disabled using the Screen Options tab on the top right of the screen. 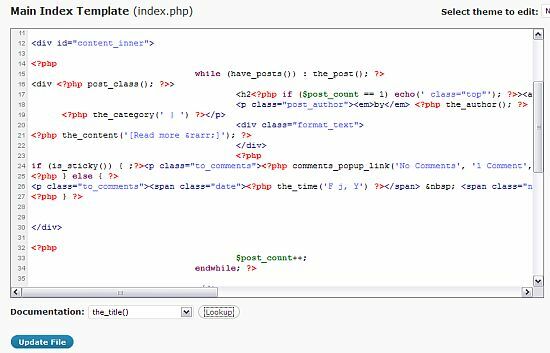 The other useful addition to the theme editor is the PHP function documentation lookup. I see no way of turning this option off and no real reason anyone would want to. It sits below the theme editor and only appears when a file has certain template tag code in it. Clicking the drop-down arrow next to Documentation will show only the template tags that are within the current file. Choosing a particular tag and clicking the Lookup button will open a new browser window or tab with an explanation of the template tag from the official WordPress.org site. This is a nice addition and a way to learn more about WordPress theme coding. As you can see the guys at WordPress continue to add value to what has become probably the best free CMS available to date.